In a very short period of time producer A.M. Breakups’ Brooklyn based Reservoir Sound collective has become one of my favorite underground rap labels. Similar to other NY labels like Backwoodz Studioz and Uncommon Records, Reservoir Sound may have roots in the underground hip hop boom of the early 2000’s, but their focus is on advancing the art with unique and talented artists who are willing to take chances and are given freedom to create. While they’ve released a handful of EP’s and singles, as well as an LP from A.M.’s longtime partner from 11:00A.M. 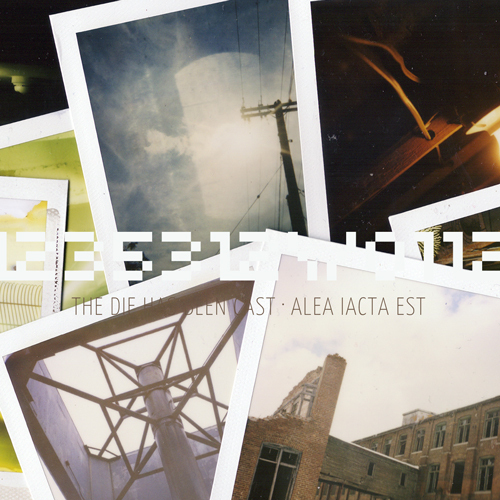 MC Eleven, their new compilation ALEA IACTA EST (The Die Has Been Cast) feels like a coming out party. With A.M. Breakups’ highly anticipated Cult Favorite LP with Elucid right around the corner, this compilation serves as an appetizer the main course that Cult Favorite should be, as well as an introduction or update to several artists within the collective. The majority of the compilation is produced by A.M. Breakups, including two standout instrumentals that bookend the project in “Filters (4LAS)” and “2 Hours of Attention”. A.M.’s roommate and beat making collaborator Jeff Markey offers a couple instrumentals of his own, as well as the albums funkiest track “Gimmie Dem Boots, Inc.”, made with Breakups under their moniker Surface Tension Beekeepers. A.M.’s frequent collaborators Elucid and Eleven each make four appearances and deliver several of the album’s highlights. Eleven contributes one of his strongest songs to date on the A. Smart produced cut “Alpha Alpha (beta version)” which is immediately followed by Elucid’s standout collab with label newcomer Hype Wonder “Newer, Better”, also produced by A. Smart and featuring the memorable chorus from Elucid- “A newer you, a better me/ and I don’t mean superior”. Baltimore MC Teddy Faley is also prominently featured, contributing vocals to four tracks as well as showing off his production chops on a couple tracks, especially his solo track “DC4”. Faley’s beat for “DC4” is a flat out banger, matching his gruff delivery to a tee. A.M. Breakups contributes a stellar remix of Faley’s classic cut “Straw Man Argument” which was originally recorded back in ’08. Faley hasn’t released a solo project with Reservoir Sound yet, but he’s definitely become one of the collective’s greatest assets. Warren Britt and new addition Shape round out the MC’s who have tracks and A.M. Breakups’ frequent collaborator billy woods makes the compilation’s one guest appearance on “We Are Not For Them –Captures, Pt. 1”, which also features Britt and Eleven. Britt and Shape both contribute excellent solo tracks, showing how deep the Reservoir Sound talent pool runs. Starting a record label in the current climate may be a roll of the dice, but when you can lead with a project like ALEA IACTA EST you may not need luck. Stream/Download the album below and find out why the Reservoir Sound collective is one to watch.